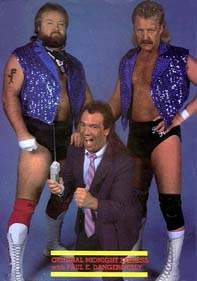 Other Names: Super Pro, Randy Alls, "Ravishing"
- Memphis Southern Tag-Team Title Tournament (March 14, '82) = The Midnight Express (Rose & Dennis Condrey) beat Steve Keirn & Danny Davis, then fell to Stan Lane & Robert Gibson. Bobby Eaton & Sweet Brown Sugar won the tournament. - NWA Starrcade '88 (December 26) = The Original Midnight Express (Rose & Dennis Condrey) fell to the Midnight Express (Bobby Eaton & Stan Lane). - NWA Chi-Town Rumble (February 20, '89) = Rose, Jack Victory, & Paul E. Dangerously lost a "Loser Leaves Town" Match to the Midnight Express (Bobby Eaton & Stan Lane).